While Ferguson residents protest the shooting of “gentle giant” Michael Brown, criminals descend on the city to loot and pillage. Autopsy proves honest witness testimony that the policeman was justified in the shooting and did not execute a surrendering teenager. But black activists, including some in government, want him prosecuted or threaten riots throughout the state. 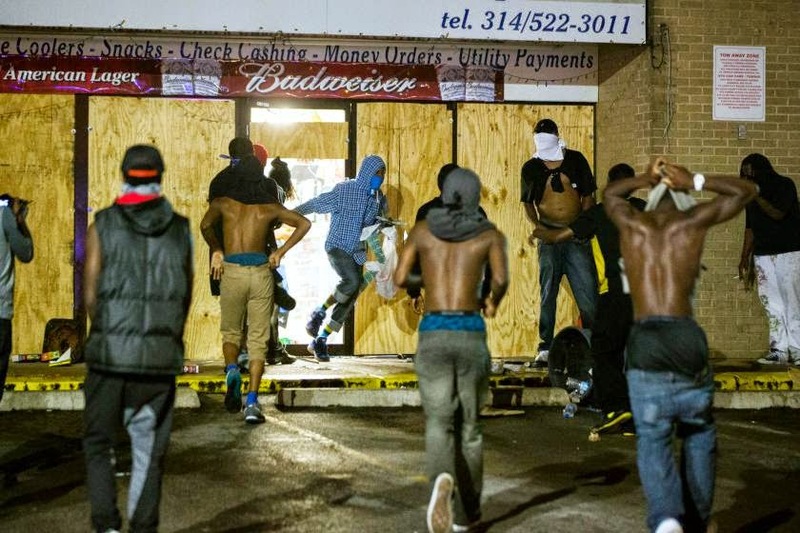 As blacks rampage through the city of Ferguson night after night, looting, burning, and rioting, the police stand aside and allow these neighborhood businesses to be destroyed. Liberals say the solution to this violence is to prosecute the cop who shot Michael Brown. Conservatives say the solution is to round up the rioters and looters and prosecute them. This is typical Democrat tactics of blaming the righteous for the actions of the wicked and their solution is to persecute those who protect the people from criminals and reward the criminals. Racists continue to perpetrate the lie that Brown was shot in the back while surrendering despite all evidence to the contrary. Black activists threaten riots throughout the country if the office is not indicted. This kind of intimidation and action is the same as those who demanded that the Romans crucify Jesus. When the criminals make the rules, then the righteous have nowhere to turn for justice. Governments, when faced with thieves, rapists, and murderers acting en masse, such as pirates, vandals, and rioters have found that the only thing that may stop this madness is rounding up those responsible and conducting mass executions. If the Left had their way there would be mass executions of the TEA Party for peaceful protests where they actually cleaned up after themselves, fulfilling every liberal fascist’s dream. Allowing 20% of the population to dominate, persecute, and enslave the other 80% is the history of the world until the advent of America. They would certainly like a return to this unless they are stopped dead in their tracks. I suggest that reverend’s Jesse and Al read this and other scriptures to the looters in Ferguson. But that would be too much like the right thing to say and it would keep lots of cash out of their pockets.